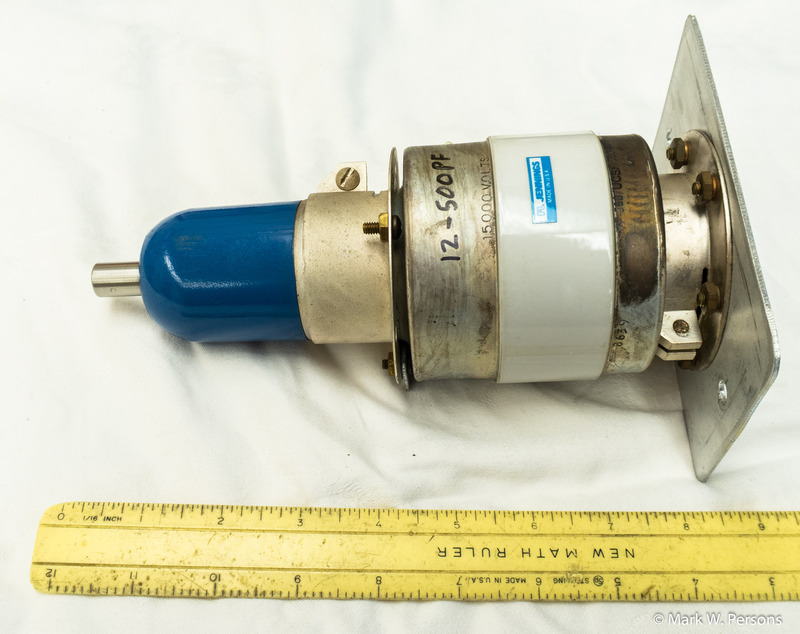 1 9-64 pf air variable capacitor. Cardwell 154-13-1. 4-1/2" long x 2-5/8" x 2-5/8". 1/4" diameter x 1-1/4" long control shaft. Plate spacing is 0.13" for about 4.5 KV. Good condition. $30.00 each. 1 6-100 pf air variable capacitor. Hammarlund APC-100. In the original box with RCA part number 52376. 1-3/4" long x 15/16" x 1-1/4". Use a small screwdriver to adjust this one. Mint condition. $35.00 each. 1 6-149 pf air variable capacitor. E. F. Johnson 149-6. Often used in CCA FM transmitters. 1/4" diameter x 1/2" long control shaft. Good condition. $40.00 each. 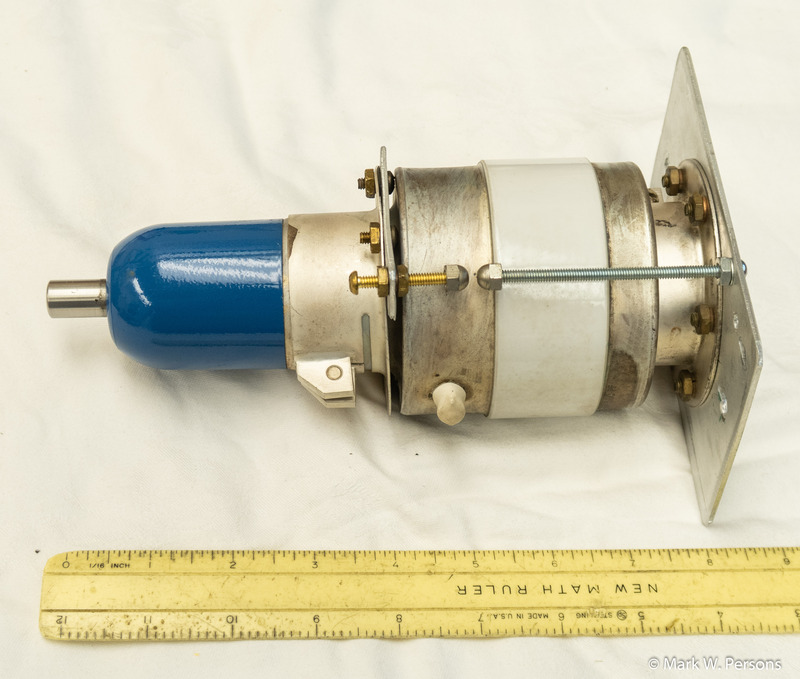 1 30 - 350 pf air variable capacitor. E. F. Johnson 350D35. 7-1/4" long, 4-1/4" wide, 4-1/4" high plus 1/2" long x 1/4" diameter control shaft at each end. 0.80" spacing between plates should be good for 3.5 KV. Good condition. $55.00 each. Mica capacitors from series 291 through 294 for AM transmitters, antenna coupling networks, and phasors. A one-foot ruler is shown in the foreground. 1 .0001 mfd/6 kv Sangamo CM75B101J mica capacitor. White ceramic body with two end flanges Good used. $75.00 each. 1 .00015 mfd/2.4 amp/6 kv Sangamo Type 291, 29160B151J02 mica capacitor. Black epoxy body with two end flanges Excellent used. $125.00 each. 1 .00015 mfd/6 amp/30 kv G4 glass body mica capacitor. Used. $200.00 each. 1 .00025 mfd/3.6 amp/6 kv G1B white porcelain body mica capacitor. Used. $90.00 each. 1 .00025 mfd/5.1 amp/10 kv G2 white porcelain body mica capacitor. Used. $130.00 each. 1 .0003 mfd/5.6 amp/10 kv G2 white porcelain body mica capacitor. Used. $130.00 each. 1 .0005 mfd/3 amp/5 kv Acu-Cap capacitor. Used. $25.00 each. 1 .0005 mfd/5.1 amp/6 kv G1 white porcelain body mica capacitor. Used. $135.00 each. 1 .0007 mfd/3.9 amps/6000 volts Sprague type 17 brown mica capacitor. Used, but in good working condition. $20.00 each. 1 .00075 mfd/6.8 amp/6 kv Sangamo 291 black epoxy with aluminum flanges. New. $125.00 each. 1 .001 mfd/4.5 amps/5000 volts Faradon UC307 brown mica capacitor. Used, but in good working condition. $20.00 each. 3 .001 mfd/7 kv Sangamo Type E mica capacitor with two 1/4-inch terminals at one end. Used. $50.00 each. 1 .001 mfd/8.5 amp/8 kv CDM F3B, F330B102JM mica capacitor with parallel bolt terminals. Used. $100.00 each. 1 .0015 mfd/7 kv Sangamo Type E mica capacitor with two 1/4-inch terminals at one end. Used. $30.00 each. 2 .002 mfd/6.2 amp/2 kv CM70B202J brown mica capacitor. Used, but in good working condition. $20.00 each. 3 .002 mfd/5000 volts/6.2 amps. F2L brown mica capacitor. Used, but in good working condition. $20.00 each. 1 .002 mfd/13 amp/10 kv G2 white porcelain body mica capacitor. Used. $140.00 each. 1 .002 mfd/15 amp @ 1875 KC/12,500 volts mica capacitor with two 1/4" terminals at one end. Used. $75.00 each. 1 .0039 mfd/18 amp/8 kv black epoxy mica capacitor. With aluminum end plates. Near mint condition. $175.00 each. 1 .004 mfd/30 amp/15 kv G4 white porcelain body mica capacitor. Used. $275.00 each. 1 .005 mfd/20 amp/6 kv type 292 black epoxy body with aluminum end plates. Excellent used. $190.00 each. 1 .006 mfd/19 amp/5 kv Sangamo G1B. White body with aluminum end plates. Good used. $90.00 each. 1 .01 mfd/24 amp/5 kv CDM Type 292 capacitor. White black body with aluminum flanges. Good condition. $180.00 each. 1 .015 mfd/27 amp/4 kv black epoxy mica 292 series capacitor. Near mint condition. $167.00 each. 1 .02 mfd/10 amps/1000 volts Acushnet 1570-808 brown mica capacitor. Used, but in good working condition. $18.00 each. 1 .024 mfd/51 amp/5 kv black epoxy mica 294 series capacitor. Excellent condition. $390.00 each. 1 .1 mfd/62 amp/3 kv black epoxy mica capacitor. Near mint condition. $325.00 each. 1 25 pf(.000025 mfd)/7.5 KV Jennings JCSF-25-7.5S used fixed vacuum capacitor. 1-1/4" diameter x 1-5/8" long. Good condition. $100.00 each. 1 25 pf(.000025 mfd)/32 KV Dolinko & Wilkins used fixed vacuum capacitor. 2.8" diameter x 6.4" long. Good condition. $130.00 each. 6 40 pf(.00004 mfd)/7.5 KV Jennings JCSF-40-7.5S/RCA 8521332-18 used fixed vacuum capacitor. 1-1/4" diameter x 1-5/8" long. Good condition. $100.00 each. 1 50 pf(.00005 mfd)/20 KV Jennings JC-2-50 used fixed vacuum capacitor. 1-1/4" diameter x 1-5/8" long. Good condition. $100.00 each. 1 500 pf(.0005 mfd)/15 kv vacuum fixed capacitor. Jennings JCS-500. Used, but in good condition. $350.00 each. 1 500 pf(.0005 mfd)/15 kv vacuum fixed capacitor. Jennings M500 with connector clamps. Used, but in good condition. $350.00 each. 1 1000 pf(.001 mfd)/10 kv vacuum fixed capacitor. Jennings JCS-1000. Used, but in excellent condition. $400.00 each. 1 1000 pf(.001 mfd)/15 kv vacuum fixed capacitor. ITT/Jennings MCI-1000-15S with 1 end plate. Used, but in excellent condition. $450.00 each. 1 1500 pf(.0015 mfd)/7.5 kv vacuum fixed capacitor. Comet CF1C-1500E/7.5. Used, but in excellent condition. $400.00 each. 2 5000 pf(.005 mfd)/10 KV vacuum fixed capacitor. Jennings SFSB 5000 10S. 5-1/2" diameter, 3-1/4" high plus 1/2" high center terminal. They have tarnished with time because they are silver plated. That does not affect their performance. They could be brought back to the original shine by using silver polish. Photo 1 Photo 2 A 6" x 6" aluminum mounting plate is included at no charge. Used, but in excellent condition. $350.00 each. 1 10-100 pf/15,000 volts ITT Jennings CVDD-100-15D1379 used vacuum variable capacitor. 2.3" diameter x 6.5" long. The control shaft is 3/8" diameter. Often found in Harris FM25K Transmitters as the C16 PA Loading Capacitor. Good condition. $400.00 each. 1 12-500 pf/7.5 KV Jennings UCSF 500 7.5S used vacuum variable capacitor. 3-1/4" diameter x 8-1/4" long. The control shaft is 1/2" diameter. Comes with mounting brackets and flanges. Good condition. $350.00 each. Not all sizes of capacitors on hand are listed below. Inquire by email. 2 500 pf(.0005 mfd)/5KV ceramic feed through capacitor used in RCA BTF-20 FM Transmitter. CRL 2DSPHTT501KAB 3/4" long x 1 5/16" diameter with 10-32" threaded ends. New. $200.00 each. 3 1000 pf(.001 mfd)/600 Volt/10 Ampere feed through capacitor. Sprague Vitamin Q series 103P505. New $10.00 each. 2 1000 pf( .001 mfd)/10 KV feed through capacitor. CRL RF 187E. Very good condition. Often used on CCA FM transmitters. $90.00 each. 1 1000 pf (.001 mfd)/10 KV feed through capacitor. Plessey type 09/U. Very good condition. Often used on Sparta FM transmitters. $90.00 each. 1 1000 pf(.001 mfd)/3 KV feed through capacitor. RCA 221716. New. $40.00 each. 1 1000 pf(.001 mfd)/5 KV feed through capacitor. Tobe F-6001-1 New. $45.00 each. 1 .01 MFD/250 VAC feed through ceramic capacitor. RCA 54643. New. $30.00 each. 1 .005 MFD/10 KVDC plastic film capacitor. Plastic Capacitor P.N. OF100-502. 1-3/4" long x 3/4" diameter. New. $30.00 each. 1 .02 MFD/10 KVDC plastic film capacitor. Plastic Capacitor P.N. OF100-203. 2-3/4" long x 1" diameter. Used and in excellent condition. $30.00 each. 1 .05 MFD/10 KVDC plastic film capacitor. Plastic Capacitor P.N. OF100-53. 2-3/4" long x 1-5/8" diameter. New in the original box. $40.00 each. 1 .05 MFD/10 KVDC plastic film capacitor. Plastic Capacitor P.N. OF100-53. 2-3/4" long x 1-5/8" diameter. Used and in excellent condition. $30.00 each. 1 .05 MFD/10 KVDC plastic film capacitor. F-C-I P.N. D6-100-50. 2-3/8" long x 1-5/8" diameter. Used and in excellent condition. $20.00 each. 1 .25 MFD/3 KVDC plastic film capacitor. F-C-I P.N. D6-30-250. 2-3/4" long x 1-5/8" diameter. Used and in excellent condition. $20.00 each. 40 3900 MFD/16 VDC Aluminum radial capacitors. New. Must order in quantities of 20 or more. $0.35 each. 60 3900 MFD/6.3 VDC Aluminum radial capacitors. Digi-Key P5209-ND. New. Must order in quantities of 20 or more. $0.30 each. 400 3900 MFD/6.3 VDC Aluminum axial capacitors. Digi-Key P6308-ND. New. Must order in quantities of 20 or more. $0.30 each. 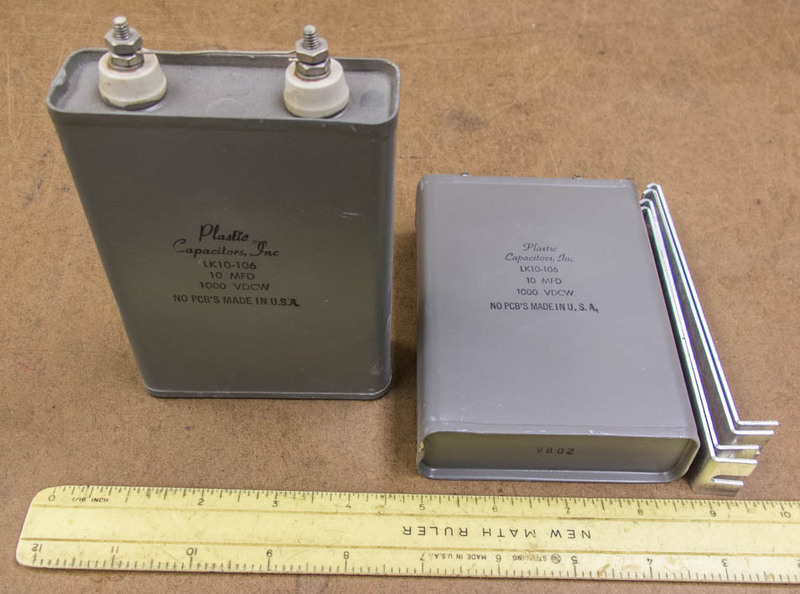 200 3900 MFD/10 VDC HFQ Aluminum radial-lead capacitors. Digi-Key ECA-1AFQ392S. New. Must order in quantities of 20 or more. $0.40 each.